Mathieu Bastareaud has been left out in the cold for the first round of the Six Nations. UNCAPPED TEENAGER ROMAIN Ntamack has been preferred to the axed Mathieu Bastareaud in the France team for the Six Nations opener against Wales on Friday. 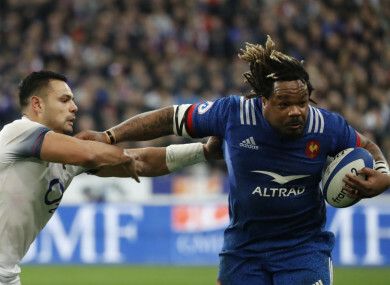 Centre Bastareaud – who captained France last year - not only misses out on a place in the starting line-up, but he will not be on the bench at Stade de France either. Coach Jacques Brunel has put his faith in the 19-year-old Ntamack, whose father, Emile, won 46 caps for Les Bleus, to take on Warren Gatland’s side after some eye-catching displays for Toulouse and France Under-20s. Ntamack – the youngest player in any of this year’s Six Nations squads – will be paired with Wesley Fofana, while South African-born lock Paul Willemse will also make his debut in Paris. Brunel has reunited experienced scrum-half Morgan Parra and fly-half Camille Lopez for the start of the tournament. Promising prop Demba Bamba, who made his international bow against Fiji last November, has been named among the replacements. Email “Ntamack poised for France debut as Bastareaud fails to make bench for Six Nations opener”. Feedback on “Ntamack poised for France debut as Bastareaud fails to make bench for Six Nations opener”.